Jen has been a Westgate team member since April 2002. She started working here while still in high school as an animal caretaker. She has moved up through the ranks and is now a receptionist. She currently lives in Elk Mound with her husband Jon and two sons, Colton and Brecken. She has three Labrador Retrievers, a King Charles Cavalier, and multiple cats. Jen enjoys watching her boys play sports, boating, horseback riding and going to the pool. 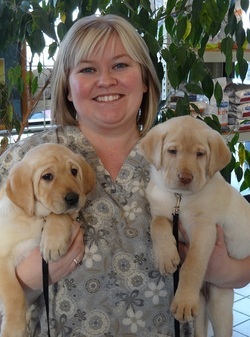 Janice started her career at Westgate Animal Hospital in April 2014. Janice currently lives in Eau Claire with her husband, Dave. They live with two cats, two Labrador Retrievers, and a Terrier Mix. When not working, you’ll find her running agility, dock diving, or just working obedience. She is also a board member of the Epilepsy Foundation of Western Wisconsin. She also enjoys visiting her son, Troy and daughter-in-law, Tiffani, in Georgia. She also helped welcome her first grandchild, a little boy named Connar. Shannon started at Westgate Animal Hospital in 2002 then left to be a stay at home mom, now is back at Westgate part-time. ​Shannon and her husband have 2 kids and 2 poodles. In her spare time she enjoys spending lots of time with her family, camping, attending music festivals and training or showing her dogs. Jennifer began working at Westgate Animal Hospital in September of 2017 after moving to Eau Claire with her family. Jennifer's pets include four ferrets and a feisty iguana. In her spare time, Jennifer enjoys spending time with her family, running, drawing and learning about animals, specifically horses. Ashten started at Westgate in April of 2018. She resides in Modovi with her boyfriend and her cat Karpo. ​Ashten is currently going to school online to become a Certified Veterinary Technician. She enjoys spending time with her friends and family, riding her horse, boating and fishing.